The record features 2Mex in the finest hour of his storied 15-year career. Over fifteen tracks, the gifted emcee showcases his charismatic, versatile flow, delivering razor-sharp observations and a signature lyrical wit over a varied selection ground-shaking and groundbreaking sounds from underground hip hop’s finest beatmakers. Appearances and production are contributed by Murs (Felt, Living Legends), Prince Po (Organized Konfusion), Busdriver, Ikey Owens (The Mars Volta), Ceschi, and many more. The album includes the lead single “Dead Hand Control”, produced by Owens and Deeskee (Shapeshifters). And so began the journey that led to classic-quality tracks such as the first single “Dead Hand Control,” the anthemic return-to-form pledge of allegiance “Back”, and the introspective “I Just Didn’t Know” (featuring Returners bandmate Stacey Dee). Organized Konfusion’s Prince Po shows up on “What You Know About,” a dedication to the under-the-radar greats that influenced a generation of hip hop. 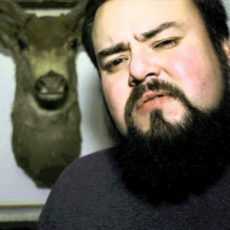 The strain of maintaining fulfilling, lasting relationships in the 21st century comes under scrutiny as 2Mex trades verses with Living Legends homie Murs on “Rollercoaster.” The subsonic bass crunch of “Press Your Luck” brings the new sound of underground Los Angeles to the indie rap masses.